The first trip to Norway saw 12 former political prisoners unite in joining together to raise awareness about their colleagues currently detained in Burma’s notorious prisons. Further trips to Norway will be made in 2010 to photograph the remaining 20+ former political prisoners who we were not able to visit this time. The final day of our whirlwind trip to Norway and still no time to see the sights. It’s a shame but it’s not a problem because we’ll be back in Norway at least 3 or more times next year… I feel this is the start of a long affair. With 11 former political prisoners already photographed on this trip so far we have just one more person to meet today in Oslo before we head back to DVB for a final round of interviews. There are a number of people who we have not been able to see in both Oslo and Gjovik, mainly because they were either unavailable or we could not contact them, but to have photographed 12 former political prisoners is a fantastic result in this quick trip an dsets it up nicely to return in 2010 to photograph all of the others. We make our way across town to meet with Dr U Win Maung at his home. He was jailed for 5 years in Mandalay prison for his political activities. The former political prisoner chosen to be written on his hand is Bauk Naw, an NLD leader from Dr U Win Maung’s home town of Mytkyina in Kachin state. One of only 4 Burmese doctors in Oslo, he is currently still waiting to pass his final conversion exams to be able to practice fully in Norway. As this is our final day we do not have as long as we would have liked to spend with Dr U Win Maung but our interview will be available here soon. The rest of the afternoon was spent back at DVB for some final filming as part of the ongoing collaboration with Democratic Voice of Burma (DVB) and as part of the latest documentary shot by Than Win Htut, we also did a brief interview explaining the background as well as discussing the current situation of Burma’s political prisoners. Here’s a brief teaser as the interview and dcoumentary will be broadcast at some point in early 2010. There’s always a surprise around the corner and I wasn’t expecting a full studio interview – but it was fun and no doubt will take a lot of editing as once I start talking its often hard to stop! Unfortunately that marks the end of our first trip to Norway and the latest leg on this world tour for Burma’s political prisoners. It’s been incredible, so much more than I could ever have imagined with friends made for life but more importantly some very good portraits taken that will build this campaign and take it to a new level. There are just too many people to thank here for making it all possible. I thank you all from the bottom of my heart. But that said the final word goes to the Secretary General for all her hard work in making this happen as it couldn’t be done without her – especially for all those hours spent holding her hand in the air as a stand in. So long Norway… but not goodbye. Whilst it’s easy to get carried away with the beauty of a place it’s just as easy to forget that that can often only act as a cover to a more pressing and often desperate situation that lies beneath – just think of Burma for example. Lillehammer, like so many places in the world, is beautiful but it’s a very long way from Burma and also is a long way from being able to be readily and easily involved in one’s activist work. This is one of the main problems that so many former political prisoners face when re-locating to a foreign country and in particular to a small town. It’s not just the whole physical and mental aspect of re-locating and trying to settle and find new work and start a new life – that’s hard enough. But it’s the fact that when you are there in your new town thousands of miles away from Burma or the activist networks in Thailand and elsewhere and often now living in the middle of nowhere, then continuing your activist work seems at times depressingly impossible. Perhaps living with little or no money, possibly no job, no access to communications or ability to meet regularly with colleagues it’s as though a second sentence is being passed down for the crime of wanting to free your country – the years in Insein were clearly not enough. Now you must go and live in the hills far away where you can’t bother the SPDC any more. The distant former life as a student, lawyer, doctor or whatever held no rank in Thailand to where these former political prisoners fled – the only life available there was in hiding or in a camp but only then if the UNHCR would recognise you as a refugee and thats a battle in its own right. Stateless people like so many who have fled Burma over the years. I can’t begin to imagine what it must be like to live like this, to have been politically active in spite of such brutal repression and then being forced to leave your country and now finding yourself what must feel like a million miles from home and at times also feeling isolated from being able to do what your heart and head is craving to do… continue your work to free Burma and your colleagues you’ve been forced to leave behind inside. It’s no guarantee but it must surely be somewhat easier if you are based in a major city where there may be better chance of work, access to services, activist groups, community etc but to be re-located to a small town far from anywhere in whichever country and even further from your home is particularly hard. It’s not just here in Lillehammer, but everywhere else I have been so far its so often the same story, from the camps on the Thai-Burma border to the big city metropolises where the suffering often seems to continue for people who have to leave everything behind through no choice of their own. But there’s a very special bond that unites every former political prisoner wherever they are in the world, whatever they are doing. For even though not everyone can be at the forefront of banging the drum of change for Burma, not one second goes by when all of their hearts don’t beat in time with that drum. My admiration and respect knows no bounds in the company of these men and women. Today was just a day of reflection in Lillehammer. We catch the train back to Oslo in the early evening for tomorrow its a final day at DVB before returning to the un-real world back home. Another day, another early start. Kyaw Soe Lin comes with us to Lillehammer, the next destination on this whistle stop tour of Norway. Famed for its ski-ing, Lillehammer is a couple of hours away by bus from Gjovik and is situated at the very northern end of the lake Mjosa. Known globally for the winter Olympics that were held here in 1994, Lillehammer is every bit the picturesque winter town. Even though its still dark, the scenery is stunning as you drive alongside the lake and fresh snow last night adds to the beauty of the place. You would have thought that by now I would have learned my lesson about leaving the travel arrangements to the Secretary General – we arrive too early and it’s like a ghost town! Everywhere is shut and we can’t check into the hotel yet so we have to wait in the bus station to keep warm! We are here in Lillehammer to meet with 3 former political prisoners – Cho Seint, Hla Hla Htwe and U Ne Win. After a brief respite in the bus station we finally drop off our bags and make calls to plan the day – first stop is to see Cho Seint and Hla Hla Htwe who each have an apartment in the same building on the other side of town and we plan to spend the day with them before meeting U Ne Win and his family later in the afternoon. Ma Hla Hla Htwe @ Bea Shote was arrested in 1989, while she was on her way to the Martyrs’ Graveyard, which is now closed to the public, to pay her respects. Soon after, she was imprisoned by a Military Tribunal for 3 years and accused of organizing people to participate in riots. She was arrested and tortured again for an explosion in 1996, the perpetrators of which were never caught. Cho Seint @ Kyaw San, a poet and journalist with the private cultural magazine Style-thit (New Style), was arrested in 1997 under Article 5 (j) of the 1950 emergency law for having written in support of the student demonstrations in articles carried by opposition publications. He was detained in Insein and Tharrawaddy prisons for 7 years. During his questioning, which took place during the beginning of 1997, Cho Seint was tortured. He was beaten on the head and is partially deaf as a result of this. This period of questioning, which lasted several weeks, weakened him physically and psychologically. He is the grandson of Thakin Kotaw Hmime, one of the fathers of independence with General Aung San. His family has been deprived of resources since 1962 by the military junta and he was receiving almost no visits or help from outside prison. A former fellow inmate said his combative attitude never flagged and he even took part in a hunger strike in 1998 to demand more water and for cell doors to be left open during the day. The prisoners obtained their demands. He resettled to Norway in 2005. In 2007 he wrote his book entitled “I Will Always Love Burma”. We make our way to their apartment building on the side of the hill overlooking Lillehammer and Ma Hla Hla has prepared us a feast – Ohn Nyot Khaut Swe (coconut noodle soup) which helps us warm up against the minus 12 degrees it is outside. We chat for ages in Ma Hla Hla’s tiny apartment and it seems like old times for old friends with much laughter and happiness all round so I sneak out to find locations for their photos. Listening to their stories its so very poignant and perhaps more so than before, because here we are in this beautiful place yet hearing such horrendous details and at the same time I feel very aware of how lucky I am. Not because I haven’t faced the wrath of the SPDC and Insein jail but because I have so many things in life – I can leave here tomorrow on a train and then head back to England before planning where to go next. And yet here we are now, sitting in a tiny apartment a million miles from home where one can be excused for feeling a sense of isolation creeping in. With the light fading fast we head outside and take the portraits and they are great. Without further delay we head down in to town – the Secretary General choosing a tray to slide down the hill – and make our way to see U Nay Win and his family. U Nay Win spent 10 years in jail – 8 years in Insein and 2 years in Myingyan in middle Burma. We have the most compelling evening with U Nay Win and his interview will be available here soon – it’s a must listen to speech. With another day done we bid farewell to Hla Hla and Cho Seint and also to Kyaw Soe Lin who heads back to Gjovik. Yet another incredible day but perhaps also the most meaningful one yet. We spent the day with the grandson of Thakin Kotaw Hmime. I think I’ll have to write more about the whole experience tomorrow as we finally have some time off. An early start as today we’re heading out of Oslo and making our way to the small town of Gjovik some 2 hours north by train. It has been such a pleasure to stay with Moe Maung Maung and yet again I have made a new friend for life. We said our goodbyes and headed off to Central station but unfortunately my planning was not up to ruthless efficiency of the Secretary General and we had to hang around for an hour for our train… stick to taking photos, that’s the moral of the story. Whilst central Oslo was somewhat lacking in snow as soon as we got through the suburbs we were met with the full splendour of the beautiful winter wonderland that Norway is famous for. Gjovik is a beautiful town located on the banks of Lake Mjosa with plenty of snow and a distinctly chilly -12 today. This section of the trip had been planned with the help of Kyaw Soe Lin who was also kindly having us to stay with him and his wife. In fact a very special thanks needs to go to not only Kyaw Soe Lin for his help in planning this trip but very importantly to both Kaythi Aye and Cho Cho Tun without whose help the whole Norway trip would not have happened. Both Kaythi and Cho Cho are also former political prisoners but unfortunately we will not have time to see them on this trip as they live in Bergen which is on the West coast of Norway some 7 hours by train from Oslo – but it’s a trip that will happen in 2010. We arrived at Gjovik and were met by Kyaw Soe Lin, U Zaw Win and Yin Min Oo and also Jimmy who had made the trip specially from the nearby town of Hammer even though he was working. Without further delay we quickly chatted with Jimmy and then took his portrait at a great location just outside the station before he had to dash back to work. This is so symbolic of the lengths that people are going to for this project/campaign. Jimmy @ Aung Myo was imprisoned in Insein for 5 years in 1990. He was jailed again in 1999 for his involvement in the 9999 operation. He fled to Thailand in 2000 upon his release from jail and began working for Khit Pyaing newspaper until 2004 when he relocated to Norway. He currently works on the Burma Foreignen Gjovik website. We headed back to Kyaw Soe Lin’s house and were treated to the usual Burmese hospitality of a superb meal followed by much talk – full interviews with all four of them will be available here in the coming weeks but in brief another 30+ years in jail was accumulated today for all the usual reasons… There are no reasons. A former NLD member from Yee township in Mon State, U Zaw Win spent 6 years in Insein prison, Moulmein prison, Tharawaddy prison and a labour camp in Southern Shan State. Yin Min Oo was jailed in 1994 under the usual section 5J and spent 5 years in Insein and Tharawaddy prisons. Kyaw Soe Lin was sentenced to jail in 1989 again like so many under section 5J. However, what is different to so many is that he was only 14 years old at the time. At aged 14 he was hauled before a military court and within 30 minutes was sentenced to 3 years in jail having been refused any form of representation. His crime? Handing out leaflets. The SPDC will stop at nothing, even regardless of age, be it with child soldiers or even jailing children who they deem to be instigating instability in the State. There are such things as standards in international law and society with regards to the treatment of people – it’s called the Universal Declaration of Human Rights and where article 9 states quite clearly that “No-one shall be subjected to arbitrary arrest, detention or exile”. But for Burma there is no law and time and time again the abuses continue under the watchful eyes of the UN and the international community. Kyaw Soe Lin spent a total of 10 years in prison. Whilst a full interview with him will be published here soon, in the meantime you can read more about his story on the Irrawaddy website. The prisoner’s name written on his hand is his brother-in-law. With what light there had been today slowly fading away in the haze of the constant snow showers, we all headed outside into the freezing temperatures to take the portraits. Finally I get the portraits I wanted to show the global nature of this project and the images are amazing and will be posted back here very shortly. Indoors, outdoors, in the sun or the snow, nothing is stopping this campaign take shape and the overwhelming strength of character and belief instilled in every former political prisoner I have met is starting to rub off on us all. I think 2010 could be very, very special indeed. The final act of the day is played out in front of the TV – another great Burmese tradition… Karaoke!! It has snowed. The Secretary General is happy with this. A good start to the day. Oslo is a beautiful city and I’m only sorry that we don’t have enough time to enjoy it properly – perched on the edge of the fjord with beautifully scenic countryside around, it’s a very long way from the madness and mayhem of London or New York… and about 6 million people fewer too! Aside from the cold it’s the light thats going to be a major issue on this trip – or rather the lack of it. There’s only really a handful of daylight hours at best and with snow clouds overhead it’s even darker so it’s more than likely that most of the portraits shot this time will have to be indoors. This is not ideal as I’m choosing not to work with a mobile studio of lights and umbrellas etc and so is more challenging that I have to work with what’s available in the person’s house or at the location that we are at, but that’s documentary photography for you and that’s what this is… a reality. So it’s back to DVB for the day to plan the next few days ahead and contact former political prisoners in Gjovik and Lillehammer – two cities a few hours north of Oslo and easily reachable by train or bus. The Secretary General @ Jacquelin San has her work cut out today ringing around Norway. We carry on filming the documentary with Than Win Thut and make plans for a studio interview that they want to do next week when we’re back from Lillehammer. Another main reason for being at DVB today is for a meeting we have to photograph Myo Min Naing, former political prisoner and now working at DVB. Myo Min Naing spent 11 years in jail at Insein, Tharawaddy and Myingyan prisons. Like so many he escaped to Thailand to be able to continue his activities and is now the man in charge of DVBs reporters inside Burma. These undercover reporters are the men and women who keep the world up to date with images and video secretly smuggled out of Burma to the world’s media… but at great personal risk and currently one of their cameramen ‘T’ (winner of the Rory Peck Award with his colleague ‘Z’) faces up to 15 years in jail as he was arrested by the military four months ago. Khin Maung Win, Deputy Executive Director of DVB joins us as we spend most of our time discussing plans and what might happen next year which naturally can’t be discussed here on this blog… it’s unlikely Than Shwe reads this but you never know (you can check back here for full details when the time is right to announce them). The hardest thing is not just getting in touch with people and then trying to explain the idea, but actually finding enough time to spend with everyone. There is so much to hear from every single former political prisoner that I meet. Stories that have you spellbound in so many different ways. But there is never enough time to hear them all and unfortunately this is too often the case – especially as much of the time we have to catch up with people during their working day. The travel plans are starting to look good for the next few days and we head off from DVB late in the afternoon to meet up with Moe Maung Maung at Central Station – he has kindly asked us to stay with him and his wife… everywhere we go and everyone we meet we are welcomed with this typical gesture of warmth and kindness. I only hope that one day I can repay it to everyone of them and their colleagues in prison. The filming continues as we make our way from the DVB office to Central Station and meet up with Moe Maung Maung. He lives to the western suburbs of central Oslo and has the most stunning view over the city from his apartment. Moe Maung Maung had been involved in the democracy uprisings in 1988 as one of the leaders of the Rangoon Arts & Science University Movement and was detained several times in 1988, 1989 and 1990. On 20th February 1995 he was arrested for his leading role in a student march at the funeral of the former prime minister U Nu. Along with 50 of his colleagues (including Moe Myat Thu & Yee Yee Htun both already photographed for this campaign) he was detained in interrogation centres and then sentenced to 7 years in prison under 5J for “Agitating the people” against the military regime. He spent 6 years in Insein and Taungoo Prison. He fled Burma with his young family in 2002 and settled in Norway in 2005. He continues to work tirelessly for the democracy movement, like so many mainly through the underground network that they were once part of inside the country and now still continue to be part of despite their new life in the outside world. We spend the most wonderful evening with Moe Maung Maung and his wife – we get the portrait done despite a serious lack of light which was of real concern at one point but a reflector and a little thought has hopefully produced a really strong shot… and the help of the Secretary General of course! You can catch the whole process in the DVB documentary when its released – it’ll be posted on this blog when available. The rest of the evening is spent listening to stories and discussing political prisoners and looking at old photos including so many of 88 Generation Students and Saffron Revolution that won’t have been seen. Whisky and Burmese food of course makes up the rest of the evening and sets us up nicely for the trip ahead to Gjovik early tomorrow morning. Leaving London is never hard. Not even when its minus 9 upon arrival at your destination. Norway has long played a hugely important role in Human Rights and none more so than to Burma. More political refugees from Burma are resettled in Norway than any other European country and it is home to more than 40 former political prisoners. It is also the home of Democratic Voice of Burma, possibly the most important and significant of Burmese exiled media organisations… and this is exactly where we are heading to kick off this flying trip to the land of the midnight sun. 9am and its minus 9. Welcome to Norway. This most welcoming of countries springs an immediate surprise – no later than taking literally a few steps off the plane we are questioned and have our passports checked. “What’s the reason for your trip to Norway? Business?” asked the plain clothes police officers… surely the Junta can’t be monitoring me that closely? But this time at least, it’s not me the authorities are looking for. It’s cold… but a truely warm reception as we reach the DVB office in Oslo and time to catch up with friends – in particular Than Win Thut, senior producer/reporter who made the short documentary about the project in Chiang Mai back in July and also Pascal Koo Thwe, author of “From the Land of Green Ghosts” and also working here at DVB. 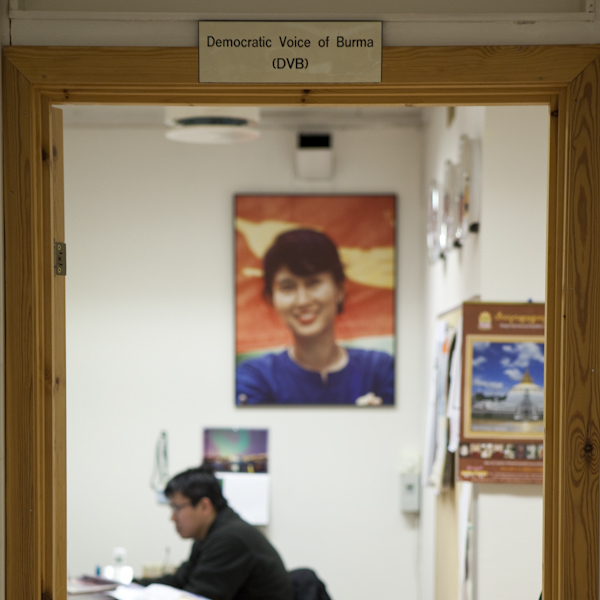 Founded in 1992, the Democratic Voice of Burma is a non-profit Burmese media organization broadcasting uncensored news and information about Burma, the ruling military regime and its political opposition. More than often the stories relay the horrible truth about life behind closed doors where journalists are seen as terrorists and foreign media are banned. DVB have teams of undercover reporters working inside the country taking huge risks each time they dare so much as to walk down the streets with their cameras hidden under their arms. It was DVB’s images that told the world exactly what was going on in September 2007 on the streets of Rangoon during the Saffron Revolution and that subsequently went on to form the basis of the award winning documentary film Burma VJ – winner of the Rory Peck Award 2009 and shortlisted for an Oscar nomination. Run by Burmese ex-pats DVB’s head office is in Oslo but also has offices in Chiang Mai and India and reporters in many countries all across the world. 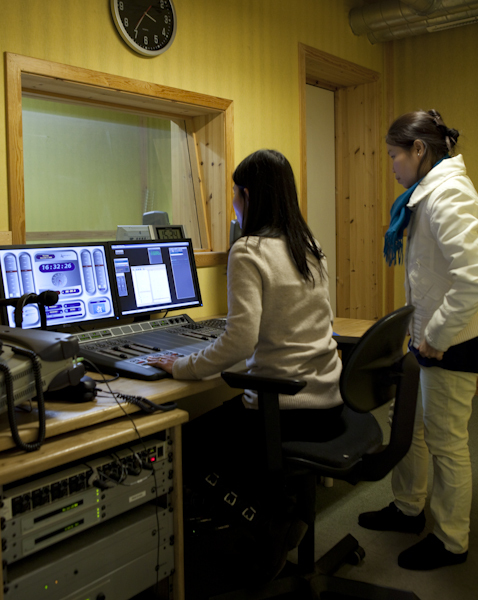 In July 1992 it started broadcasting short wave radio programmes back into Burma and in 2005 it expanded its programming and began satellite television broadcasts that now are not only broadcast into Burma but also across the world, reaching tens of millions of people. You can now watch DVB on the internet at Livestation. It’s a usual busy working day at DVB so in between the various broadcasts, editing and interviews the staff are busy doing I manage to grab a brief time to chat to and photograph Yee Yee Htun who works on radio broadcasts and Moe Aye who is News Editor. 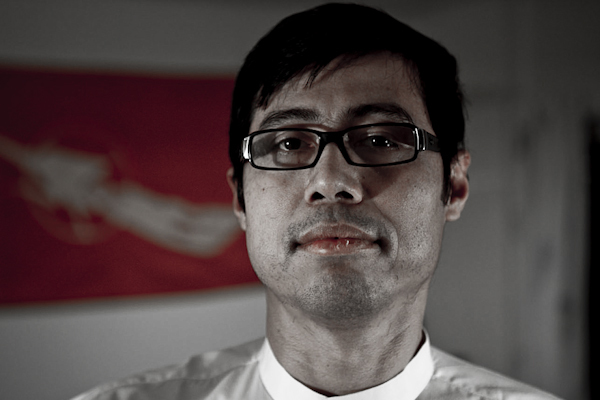 Yee Yee Htun has participated in political movements since the 1988 democracy uprisings. She was arrested in December 1996 after her involvement in the Student demonstrations in Hleddan Junction. She was interrogated for 10 days then placed in solitary confinement in the women’s cellblock in Insein prison. She was finally put on trial in March 1997 and sentenced to 14 years in prison. Moe Aye was a student at Rangoon Institute of Technology RIT throughout the 1988 uprising as a member of the ABFSU and the youth wing of the NLD. He was arrested by Military Intelligence on November 7, 1990 for an article he had written and was charged under Section 5(j) of the 1050 Emergency Provision Act being sentenced to seven years imprisonment with hard labour. He spent more than 6 years in Insein prison before fleeing to Thailand where he resumed his journalism and is now News Editor at DVB in Oslo. 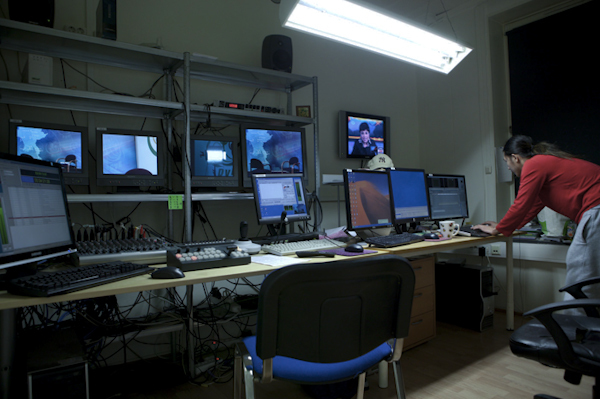 We manage to take each portrait in the working environment of the DVB offices – one in the radio broadcasting studio and one in the TV studio. Not easy given the size of the radio broadcasting room and four people squeezing in, but we make them both happen and they are truly great shots, capturing each person in the DVB world… the world that is showing the rest of the world what’s going on inside Burma. I am particularly pleased with Moe Aye’s portrait as it’s my anti-portrait shot… it would have been too easy to stage a perfect shot in the TV studio as we had every kind of light possible to make it a typically beauty studio portrait… but that’s exactly the kind of image I don’t want. By showing it simply with elements of the studio in the final frame, like studio lights and cameras, it gives it a more documentary feel. The message is in the whole photo, not just the hand or the face. Often it’s what is going in the background or what the background is that has as much relevance – showing where the person is now living or what they are doing and what’s going on around you that you are not necessarily aware of…often under the surface where the real hard work is being done to make change inside Burma. As well as taking the photographs of the former political prisoners, DVB also want to make another short documentary of the project whilst I am here – continuing on from the previous one shot in Chiang Mai… maybe this will be the next Oscar nomination!! Than Win Thut again follows me around capturing every moment and detail as we set about shooting inside DVB offices and across Oslo. An amazing first day comes to an end as we retire to stay with Than Win Thut, Pascal and Maung Htoo at their apartment just around the corner. The Secretary General cooks a feast for us all… and whisky and plenty of talk late into the night does the rest.